1. Start with Something You Love: Passion. Dedication. Consistency. These are the power words that should be in your vocabulary surrounding your writing. As with any talent, you need to have the urge to continue improving. It doesn’t matter if you’re looking to write your first article or hundredth, you have to love what you do! When you’re researching material or are waist deep in constructing the layout of your next article, reflect on how you feel about the process. If you’re uncomfortable and it feels like W-O-R-K, improve your mindset or focus on a different niche. 2. Let Your Writing Ease Your Stress: Everyone has stress at some point. There are no perfect days where everything worked out ‘perfectly’ without a single moment of irritation (highway traffic tends to back up this claim). If you can learn how to rise above the stress and put more effort into ‘letting it go’ through your writing, amazing results are sure to follow. Some relieve stress through exercise, social events, or a more common stress reliever… eating. Why not use writing? It’s both productive and relaxing. It’s one of the best ways to keep your mind alert and to let your creativity lead you to success. You can even write down recurring stressful situations in your day and work on eliminating them one by one. 3. Allow Yourself Time to Improve Your Technique: Procrastination can dig deep into your productivity and give you reasons to do nothing. However, it’s acceptable to take breaks from your work. Use your downtime to improve your writing technique by thinking about the direction(s) you would like to go. It will take time to perfect your craft. The sooner you realize that time is your friend, not your enemy, the sooner you will be able to make better use of it to generate your best material. One of the best ways to remain constructive when you’re taking a break from writing is reading! Check out this article to learn 5 Ways Reading Can Encourage Better Writing Techniques. 4. Take a Trip and Explore an Area in Your Niche: We could all use a vacation at some point; the weekend always goes by so fast! Many people have the time and resources to travel to exotic locations at a moment’s notice. This is not the reality for the majority of us. Think about the niche in which you focus your expertise and explore it further with a road trip. Are there any specific cities nearby that can help you learn more about your niche? If not, you should at least take a notepad or other data-collecting device to capture your surroundings. You never know what you’re going to find when you actively explore new places. Be prepared! 5. Write Down Your Goals: Setting a goal for yourself can be as simple as “I want to write more.” However, saying this to yourself doesn’t always give you the motivation you need when procrastination is blocking your way. You need to write them down and put effort into creating milestones with quality checks. Make sure your goals are achievable and that you are able to stay consistent with your writing. Envision how your next writing piece will turn out and work toward it with unrivaled devotion. Continue making progress with your goals each day. This blog can help you eliminate distractions; it may be the advice you need to awaken your potential! 6. Confront Your Fear of Living Up to Expectations: It can be a challenge to write consistently and be ‘in the moment’ when you’re trying to write. You’ll often get pressured by time constraints or updates from business associates to finish a project. Living up to expectations should give you a sense of pride as you write. Sometimes you need to focus less on pleasing others and just face your fears head on. The only battle you should be fighting is to beat writer’s block. Come up with the best content for your readers. Get back your confidence! 7. Revisit Old Books and Articles: An excellent way for you to restore passion for your work and kickstart a new project is to reflect on the past. It’s a healthy practice to look back on prior successes in order to see your potential and where you can improve. If you have old books, articles or even artwork that you’ve created, get ’em out! If you can’t visualize your next idea easily, revisit old work to gain a spark again. Everyone is unique in their own way. You don’t always have to stay in the present to increase your expertise. Well, how did you feel about our tips on getting authors back into writing mode? 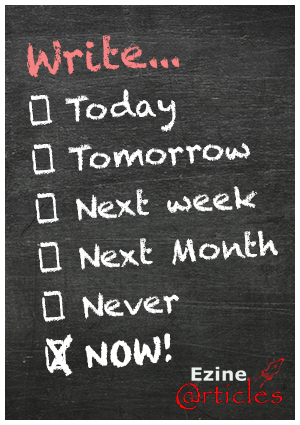 Are you procrastinating finishing the rest of this article? There are only a few more lines… promise. If you’d like to pass on some encouragement for other writers, preferably those who are just starting out, we can certainly help in that area. Take a look at our article titled 10 Ways to Inspire, Motivate, and Encourage a Young Writer for some helpful ways to inspire others to share their knowledge as well. If you have any desire to comment on what you’ve just read, now is the time. Share your thoughts in the comments below! Terrific points. I love the way you focus on the joy and enjoyment factor of writing. If we can see it as the treat and pleasure it truly is then why procrastinate at all. Thank you for posting this. I am certainly going to share. Thank you, Han for your delightful comment. You are so right. Please do share. I stopped writing articles for a few years and I’m now going to begin doing so again. I am also found on FaceBook. Writing helps to share your views and experiences with the whole world. One starting early reaches the destination in time, but the laggard. Very useful tips presented here. Very well written and very helpful! Thanks!! What a helpful post with valuable tips! These are very simple tips, and straight to the point. They can definitely help fight writer’s block effectively! I think one of the best tips, would be to clear your head with some hyper activity. When you increase the blood flow to your brain, you can get more creative and inspired. That is what I have learned from my own experiences. When I need some inspiration and more creativity to write, I often go for a walk in nature. Sometimes I would listen to an informative audio book on my favorite topics, and sometimes I would just listen to nature. I completely agree with your comments! I also believe that walks are underrated. It’s important to get outside to explore nature often, then get back inside and write while capturing what you experienced. Inspiration can be found from a short walk around your neighborhood. Continue writing and sharing your thoughts, Freddy! i like your starting point: Starting with something you love. When I write about something I’m passionate about, the words just keep coming..like water from a spring. I never have to fight writer’s block because I get inspiration everywhere.. I just have to capture these ideas and turn them into words which come naturally. I just need to show up, be there and be ready to write. I remember Steve Jobs saying, “Love what you do and you never have to work a day in your life.” Or something to that effect. So, thanks for the reminder. Enjoyed this, thank you for writing and sharing. It gives a good feeling to share thoughts and ideas, so there is never any need to procrastinate for me. I can’t sleep when I have new ideas, so it’s actually the best thing to do to submit a new article right away, giving you more time for the editorial phase once words are keyed in. Thanks for the useful tips. Truly, writing requires a lot of dedication and self-motivation. Though results appear far at a distance, writing should be kept going.